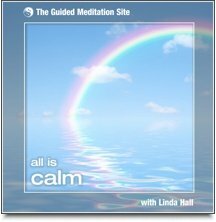 This could just be our most spacious, relaxing guided meditation download yet. Close your eyes and listen to the preview above and you'll get a lovely taste of just how calming this guided meditation is. In All is Calm, soothing sounds, positive affirmations and guided imagery all help bring calm to every level of your being. This beautiful and simple meditation uses the rhythmic sound of ocean waves and positive affirmations to induce a state of deep relaxation, whilst encouraging feelings of calmness to spread throughout your body and mind. With a duration of 20 minutes, All Is Calm is long enough to have a profound and deep effect on you, but not so long that you won't find time to listen to it. At the start of the day, and the end of the day, during your lunch-break - this guided meditation will really make it easy for you to "get calm" whenever you want.